I wasn't even born yet when Halloween came out in 1978 and too young to appreciate Curtis' career as a scream queen up until 1981, but that doesn't mean I'm not a rabid fan of hers and her subsequent horror films after Halloween. That's why I could barely contain my excitement when I found out that there would be a biography coming out, chronicling her career in horror. I have to admit that, when I found out that Grove's book was unauthorized, I was a little skeptic as to how accurate the information was going to be. It turns out that my skepticism was a little premature, because I found the information in the book to be very informative, not only about Jamie, but about all of her films. 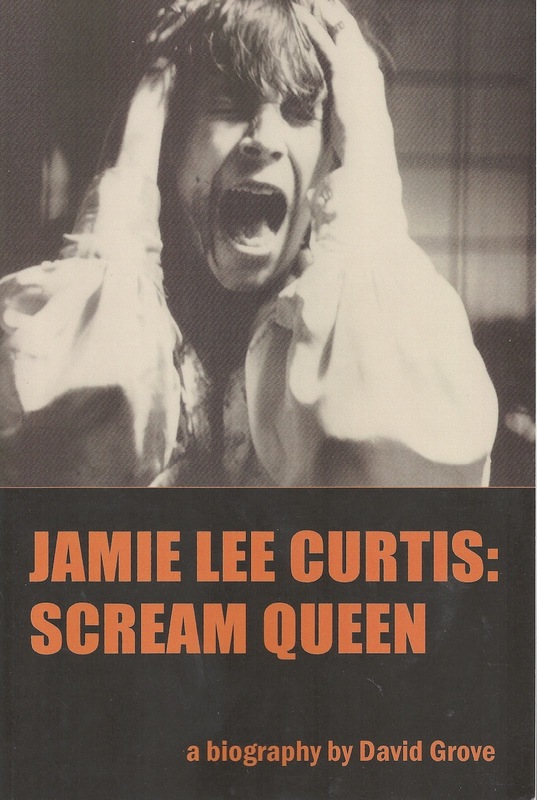 The book starts off with Jamie's adolescence and her struggles with growing up with two of Hollywood's royalty (Janet Leigh and Tony Curtis) and perhaps what was most surprising to me, was Jamie's insecurity as a teenager and young adult. Each chapter focuses on the horror films that she has starred in, how she got the part, the making of the film and the post-production of it. The readers gets a real inside look at Jamie's experiences on each of these films and her relationships with her fellow actors and filmmakers. If there is any fault to the book it is the constant repeating of who Jamie Lee Curtis' parents are and how tough it was for her to grow up with such famous parents. The book has a tendency to, at times compare Jamie to her mother, the reigning scream queen, Janet Leigh. Which I think Jamie has dealt with all her life and would probably rather not have a book focus too much on that part of her life. If you are a Jamie Lee Curtis fan or a fan of John Carpenter or any and all horror films of the late 70s and early 80s, this book is great for fans of the genre.